Law, Commerce and Biomed students! Lend us your ears. 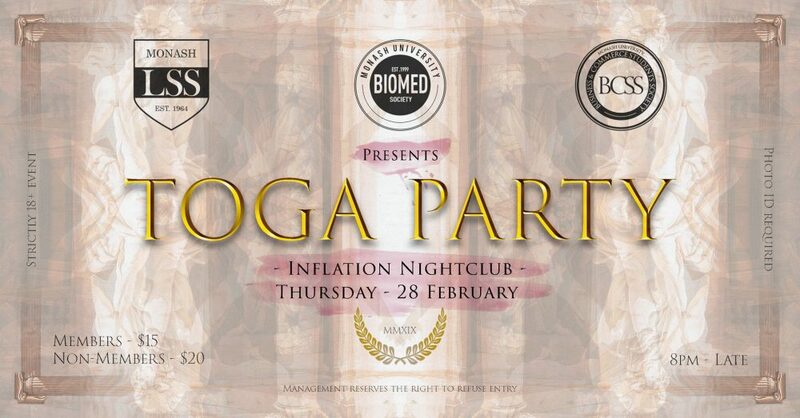 The triumvirate of the Monash Empire are joining forces to bring you a Toga party at Inflation Nightclub on the Thursday evening of O-Week. Whether you’ve been Rome-ing the world or chilling in Melbourne this summer, there is no better way to kick off your Uni social calendar than with a boogie and a couple refreshing beverages with friends both old and new. So, get Agrippa your Mum’s oldest bed sheets and a pair of Birks because this is not an event you want to myth. All mortals are welcome, but being a member of LSS, BCSS or the Biomed Society brings perks! A sell out will be inevitable, so be sure to Caesar a couple of tickets for you and your mates during O-Week at one of our tents or online.